Talk about a rimless bowl, a cyclone style flush, and a proprietary glaze; it is near impossible not to mention TOTO and American Standard. And now, KOHLER. The arena for flushing power and bowl scouring rinse is getting a little crowded. With its two-piece Corbelle, it seems KOHLER is re-inventing itself and adding more water power to its already powerful AquaPiston Flushing System. The days of complaining about the dismal rinse that the rim holes provide are numbered. But is it too late for the party? Never too late when you have got something that’s proven to work even better. The bigger question is the direction that KOHLER will be heading. Does that mean you can expect more KOHLER toilets will be designed like the Corbelle? That will depend on how KOHLER Corbelle is fairing in the marketplace, and how receptive you (the beloved user) are towards this revamped KOHLER toilet design. So is it time to discard that old Cimarron or Santa Rosa of yours and replace it with a Corbelle? That’s entirely up to you, and it doesn’t hurt to read through this KOHLER Corbelle toilet review and find out its true mettle. Is The Corbelle Really Flawless? OK, that sure sounds contradicting. In fact, the Corbelle still has the rim, or rather a lip that goes around the inside perimeter of the bowl top. But, without the tiny rim holes to stream water into the bowl for rinsing. Instead, the Corbelle bowl spots a large opening at the top side of the pan. And this is where water from the tank jets out and spiral down to the bowl outlet, and scouring the entire bowl surface for a thorough flush and rinse. So now, the purpose of the rim is to prevent water from splashing out during a flush and for guiding the water flow. Such a bowl design is often referred to as rimless because there is no need for distributing water through rim holes lined throughout the bowl rim. A rimless bowl is easier to maintain because there are no hidden areas for bacteria, limescale, and grime build up. Any dirt or debris will get washed down the pan instead of getting caught under the rim. And cleaning is simply a wipe round underneath the lip with a soft cloth or sponge. No more hard brushing and spraying to dislodge dirt that is blocking the rim holes because there aren’t any now. Compare to the conventional rimmed bowl; this sweeping water motion is a lot more effective in removing sticky waste off the bowl surface. Add to that; the Corbelle uses a proprietary glaze, the CleanCoat which enhances rinsing efficiency. The CleanCoat is KOHLER’s version of TOTO’s CeFIONtect and American Standard’s EverClean surface glaze. The Corbelle bowl surface is coated with an ultra-thin layer of nanoparticles to iron out crevices at a micro level. The result is a super-smooth bowl finish that prevents waste from sticking stubbornly onto the surface. So it offers tremendous help to the swirl flushing and leaves you with a clean bowl with every flush. Besides, it makes the unsightly skid marks difficult to form. And according to KOHLER, the CleanCoat surface can inhibit the growth of water scale and mineral stains usually associated with hard water. That makes a lot of sense since an ultra-smooth surface offers no micro-crevices for microbes and debris to accumulate and grow. When you give wings to an already powerful flushing system, the result can only be phenomenal. The AquaPiston is undoubtedly a powerful flushing machine. Given its unique design that provides more volume and speed, together with the CleanCoat and a rimless bowl, the overall flushing and rinsing efficiency can only be better. So the KOHLER Corbelle is using the Revolution 360 Swirl Flushing Technology. This is a flushing system which comprises the AquaPiston canister flush valve, a rimless bowl, and the CleanCoat finish. And it is definitely a better flushing system compared to the old rimmed bowl and conventional glaze. And in case you are new to the AquaPiston, the benefits it offers is unprecedented during the times when the flapper rules every toilet flush valve. Its canister form allows water to flow out of the tank from all sides (360 degrees). Higher water flow rate compared to the flapper valve. It has a 3:2 ratio funnel that directs and streams the water flow for optimum flush power. It has 90% less exposed seal material than a 3-inch flapper assures a leak-free performance. The lower actuation force (than a flapper) means it only requires a light touch to pull a flush. It is more durable than the flapper valve. Who doesn’t? But it’s a necessary task if you want to keep your bathroom in a clean and hygienic condition at all times. And you should. Fortunately, this KOHLER Corbelle is a skirted toilet. So at least you don’t have to deal with every nook, crevice, and corners that the trapway poses. You will sure love the flat skirting surface as cleaning is one smooth wipe across or down. No more scrubbing with the finger in those hard to clean crevices. So ladies, if you have to do the manual work, your nails are safe. And if cleaning the bowl is just as frustrating, despite having the CleanCoat, there is another Corbelle model that comes with the feature, ContinuousClean. It self-dispense a consistent amount of toilet bowl cleaner with every flush to keep the bowl clean between flushes. With this feature, the bowl stays clean longer and helps reduce the frequency of manual cleaning. So, whether you find this feature a must-have or otherwise, the Corbelle is designed for easy upkeep and improve the overall hygiene and cleanliness of your bathroom. This KOHLER Corbelle toilet offers the flexibility of 3 rough-in sizes. So whether you are with a 10″, 12″ or the rare 14″ rough-in, you are well covered. A separate trap attachment makes it possible to swap sizes. Just make sure you order the right rough-in attachment with your toilet purchase. This concept of not having a fully molded trapway is not new. The main advantage it offers is the flexibility to change the toilet rough-in. So even if you made an error with your purchase, just re-order or exchange for the right attachment size. Or when you need to relocate the toilet to a different rough-in size, you only need to buy the right trap attachment. Especially convenient when you acquire a pre-owned property; you can consider moving the Corbelle to your new home. Though usually, people will replace the existing crapper with a new one, after all the toilet is a very personal item. But if it is still in good condition, and the rough-in is no issue why not. You may not agree with the suggestion. However, the option is there for you to explore. Think of the money you can save for the other essential items you need for your new home. These days a dollar saved is better than a dollar earned. And there’s a good chance that you will agree this is a viable option when you discover how easy it is to install this KOHLER Corbelle toilet. And here is another money-saving opportunity with this Corbelle toilet. If you don’t mind a little dirty work, you can install the toilet yourself. That’s because the toilet has a quick install feature, the ReadyLock installation system. Anyone who has installed a skirted toilet before will understand the challenge, even for a seasoned plumber. But with the ReadyLock, this KOHLER Corbelle toilet is easy even for a first timer. So why pay for a plumber when you can do it yourself. 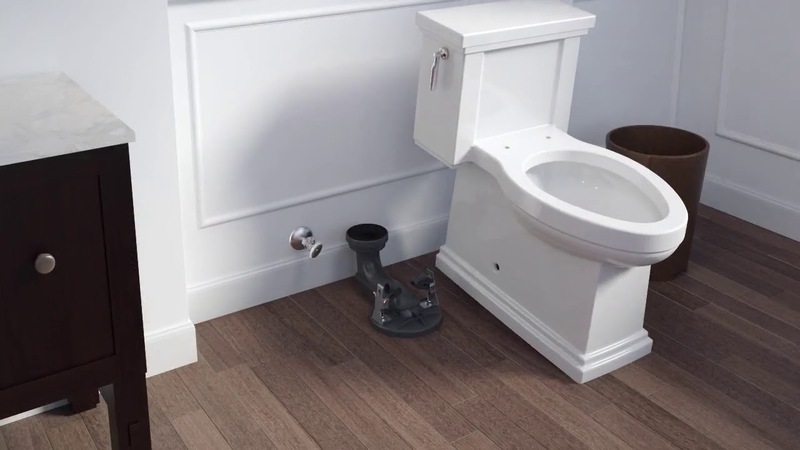 Unlike the typical skirted toilet, you don’t need to drill any holes on the floor. In fact, the power drill is not required for the installation. All you need is a socket wrench and a screwdriver for securing the bowl to the flange. Watch the video below and see if this is easy enough for you. Of course, not everyone is keen to DIY a toilet replacement. So the ReadyLock may not be an advantage at all if you intend to hire help. But again, you have the option should you decide to save the money for hiring a plumber. And in case you decide to try, please do not do it alone. The fragile porcelain bowl weighs about 100 lbs. So do get a friend or family member to help. Every product is designed to solve problems. If you were to extrapolate that notion, the more problems solved, the closer it gets to perfection. So does that mean the Corbelle is flawless in its design? Let’s list out the problems it helps to solve and those it didn’t. Powerful Flushing. This is not an option and should not be compromised. A strong flush is useful when you have a heavy load to clear. And the dreadful clog can be reduced. The Corbelle uses the AquaPiston which is known for its flushing power. Revolution 360 Swirl Flushing. Compare to conventional flushing (rim holes and vertical flow), a sweeping swirl is more effective in bowl rinsing. The scouring motion gets you a clean bowl with every flush. Besides, the rimless bowl offers an easy clean to remove any dirt which may have survived the flush. CleanCoat Finishing. When skid marks is a pain, an ultra-smooth bowl surface can alleviate the problem of water scale and mineral stains formation. And it prevents waste from sticking onto the bowl surface. So the need to flush a second time for a clean bowl is significantly reduced. Skirted Design. The benefit of a skirted toilet is pretty obvious. It has more flat surfaces than one with its trapway exposed. That means cleaning is a lot easier and faster. Two-Piece Design. While it has the advantage of replacing the tank and bowl separately, a thorough clean still requires some attention to details. Like the area underneath where the tank sits and the tank-bowl joining area. That’s where mold and dirt are likely to gather. So this is the only disadvantage of the Corbelle. KOHLER toilets are known for its elegant exterior. The luxurious exterior of the Corbelle is another testament to KOHLER’s undivided attention to aesthetics. And now with the rimless bowl, a better bowl glaze, and the Revolution 360 flushing system, the KOHLER Corbelle toilet certainly has the traits of a winner. As you can see, the Corbelle has all the better features that solved the problems associated with the common toilet. Except maybe a one-piece design will totally squash the little imperfection of a two-piece crapper. Perhaps a future one-piece or a round bowl Corbelle model is in the making for those without the luxury of space in the bathroom. The probability is high, and you may see that happens sooner than expected. But don’t forget, the price of a one-piece toilet can never be lower than the two-piece. So are you going to wait for the perfect one-piece Corbelle? Or grab this two-piece KOHLER Corbelle now and start to enjoy a cleaner and more hygienic toilet. Add to Flipboard Magazine. Thank you for this review. My big concern is the noise of a flushing toilet. Have you heard it flush? Is it super loud to do all that water swirling? The last time I flushed a TOTO in a public space, it was so loud, I had to plug my ears! I want a toilet that won’t wake the neighbors. Thanks! Thanks for all this information, however what I’m looking for is a 19/20 inch toilet bowl for comfortable seating, where do I find that?